Leave the key fob in your pocket with Smart Entry and Push Button Start. Walk Away Auto Lock® saves you a step one you've arrived. The 2018 Accord Hybrid features the most advanced iteration of the innovative two-motor hybrid powertrain. With it, the Accord Hybrid received an over 600 mile EPA range rating—making this vehicle the ideal companion for commuting and road trips alike. The Hybrid features an E-CVT standard on all models. The high resolution, touch screen Energy Management System Display in the Accord Hybrid shows real-time energy flow between the engine and electric motor. 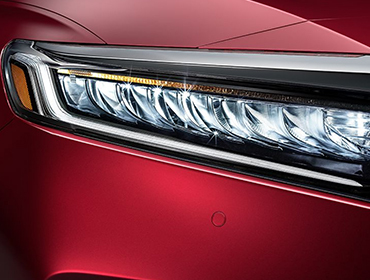 Elegant LED Low-Beam Headlights with Auto-On/Off, now standard on Accord, provide a bright, focused beam for greater visibility down the road. Touring models feature full LED Headlights with Auto-On/Off. 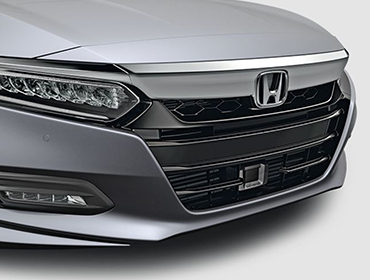 Opt for the Front Grille accessory, available in either Black Chrome for an aggressive and sporty edge or Chrome Finish for an upscale addition to the newest Accord. The Multi-Angle Rearview Camera* shows more of what’s behind you. An available Cross Traffic Monitor alerts you to vehicles on either side. Every Accord comes with Honda Sensing® standard, and intelligent suite of safety and driver-assistive technologies that can help you stay aware on the road and could even help avoid a collision. It's the most comprehensive suite offered standard in it's class among mid-sized sedans. Features Include: Collision Mitigation Braking System™ (CMBS™), Road Departure Mitigation System (RDM), Lane Keeping Assist System (LKAS), and Traffic Sign Recognition (TSR). Standard Auto High-Beams Headlights automatically dim when other vehicles are detected, and the LED Headlights further light the road ahead.